R : 180 . 90 D management system; the second is its antithesis. However, 180 days is being allowed for in the recently Previously, the RCP renewal cycle was every three years. published AWO ‘frequently asked questions’ guide. It does This has now been increased to every ? ve years, with a appear that when you are at the 5 year (not the previous 3 mid-period RCP external audit to be conducted between year) renewal of your RCP status, the window will shrink Years two and three, or between Months 24 to 36. The to 3 months prior to the renewal date. You can still have requirement is to be phased in over time, based on the your RCP audit conducted by a TVIB certi? ed RCP au- company’s current RCP renewal status date. Also, the re- ditor 180 days prior to your RCP renewal date (the date quirement to have 100 percent of all vessels audited (as op- listed on the RCP “status” page of the AWO website), and posed to as little as 10 percent) will be phased in over the still keep the same renewal date with no “certi? cate creep,” ? ve year cycle. Equipment in lay-up status will not need to but next round, it shrinks to 90 days. The requirement be audited, however, if they are in use just prior to the ? ve- to have all non-conformities corrected prior to recerti? ca- year renewal date and have yet to be audited, these vessels tion is still in place. You’ll only have 180 (then 90) days to will need to be audited prior to the company being issued a correct any line items on the worksheet or checklist with renewal certi? cate. This adds another item to your lay-up which your company is not in compliance. The need for checklist: whether or not to have the vessel go through an a pre-audit to ? 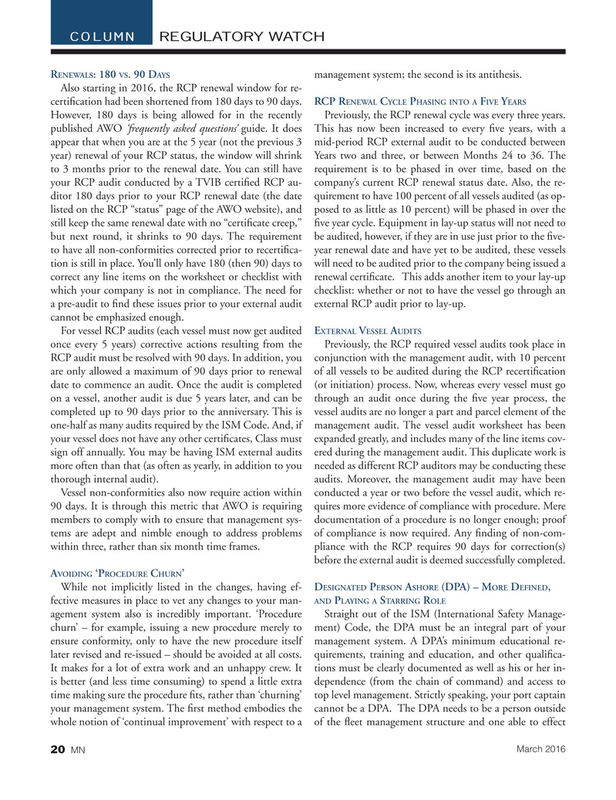 nd these issues prior to your external audit external RCP audit prior to lay-up. cannot be emphasized enough. Vessel non-conformities also now require action within conducted a year or two before the vessel audit, which re- 90 days. It is through this metric that AWO is requiring quires more evidence of compliance with procedure. Mere members to comply with to ensure that management sys- documentation of a procedure is no longer enough; proof tems are adept and nimble enough to address problems of compliance is now required. Any ? nding of non-com- within three, rather than six month time frames. pliance with the RCP requires 90 days for correction(s) before the external audit is deemed successfully completed.